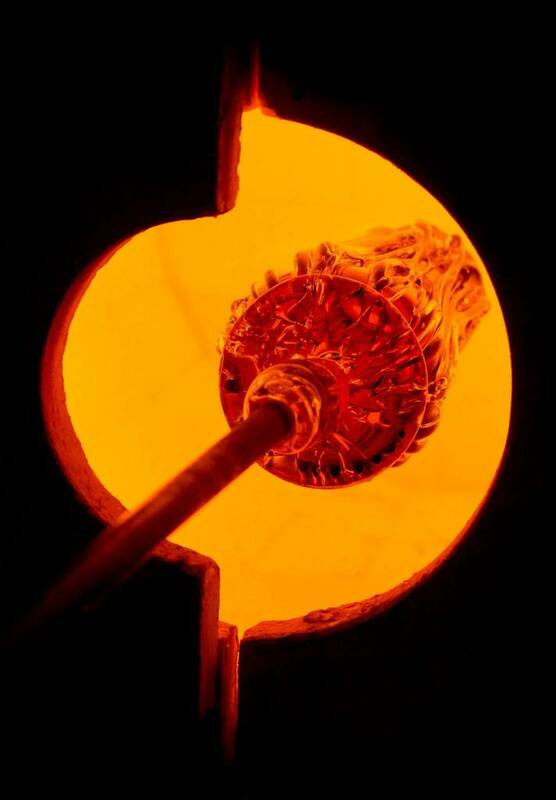 Colored glass can be added to the hot glass throughout this process. Colored glass can be applied in the form of powder, different size chunks (frit), and in a molten state. For example, Eric Dandurand uses colored glass in all of its states and in a variety of combinations and layers to attain his finished product. He often manipulates the surface of a piece into a specific decoration involving both texture and color. Once the gathering and decorating are finished, the glass is hand formed and blown into its final shape. At this point, one can further embellish a piece by misting it with metallic salts. This creates an iridescent layer. This is a very sensitive process in regards to timing, temperature, and oxygen atmosphere. The piece is then placed in an oven where it is annealed (slowly lowered in temperature at a rate that ensures thermal balance – to prevent cracking). The final stages involve grinding, polishing and inspecting the work before it is signed and dated.